With her senior year looming, Tess McKinnon has two goals: hanging out with her best friend, Liz, and avoiding her judgmental, alcoholic mother. Then yummy John Bartley arrives—to tell Mrs. McKinnon that her daughter is dead. Distinctly still alive, Tess is baffled by John’s tales of 1800s time travel, rewritten lives, and love. She knows she’s never seen him before, but her feelings refuse to be denied. After The Sun, the Moon, and Maybe the Trains left readers filled with melancholy and heartbreak, we hoped that wouldn't be the end for our friends John and Tess. 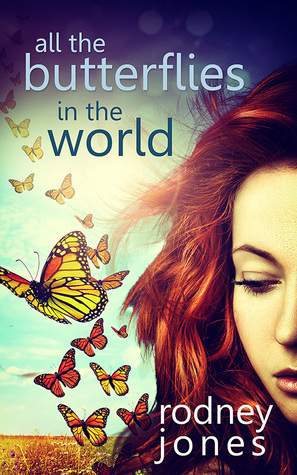 All the Butterflies in the World open with John traveling to Tess's Mom's house to deliver the bad news: Tess is dead. But somehow, when John traveled to the year 2009, he arrived earlier than the previous trip. And Tess is alive. John and Tess are both wonderful characters, and they share the role of main character perfectly. John is the most polite and respectful young man that anyone would expect to come out of 1875. While Tess is the loud and somewhat inappropriate yet strong and brave young woman that she has to be. Readers will enjoy the humor that emits from John and Tess, while also noticing their slow fall into love. While the first book did create initial bonds between readers and our two main characters, this book takes it a step further. Because John travels to an earlier time in 2009, Tess doesn't remember him and thus their relationship restarts at the beginning. Readers witness John's struggle to convince Tess that what he says is the truth, trying, at the same time, to keep from scaring her. When John goes back into the past to try to set a few things right, all of a sudden his life is on the line. Charged with Tess's murder, John spends countless days in jail praying for a miracle and filled with regret at leaving Tess. Meanwhile, in the 2009, historical documents suddenly change, telling Tess what happens. Though thinking she may have jumped off the deep end, Tess refuses to let John die. Readers will love Tess's problem-solving attitude and understand her fear. The actions that both main characters take are respectable and solidify the bond formed with the readers. The plot of All the Butterflies in the World is filled with humor, excitement, and surprise. John and Tess reconnect in 2009, a few days before the first book takes place. After the initial shock of Tess being alive and well, John tries to rekindle their friendship. In an attempt to let him prove his claims, Tess takes John to a museum where they learn of his family's fate. And the rest is trying to change history. Readers who enjoy a sweet love story and time travel conundrums will absolutely adore this sequel. I think the best part of the book was the subtle claim that everything had worked out the way it was meant to. While a past resident of Michigan, Ohio, Illinois, Florida, New York, and Vermont, Rodney now resides in Richmond, Indiana, where he whiles away his days pecking at a laptop, riding his ten-speed up the Cardinal Greenway, taking long walks with his daughter, or backpacking and wilderness camping.